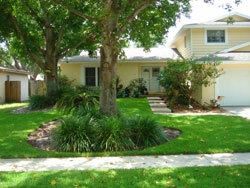 Evergreen Total Landscape is a Tampa landscaper that customers have trusted since 1983. We have a staff full of highly trained professionals that can make any property look immaculate, from grocery stores to hardware stores, private residences to restaurants, and everything in between. All of our landscapers are extensively educated and follow all Florida guidelines, so our customers know that every detail of their landscaping job will be done by the book. Customers love us because we take a proactive approach with every service we perform. We frequently inspect the properties we maintain to ensure all plants are looking fresh and all sprinklers and other devices are working properly. At Evergreen, we never consider our work finished until the customer is completely satisfied. Call or e-mail us today for more information about why we’re the Tampa landscaper that customers have turned to for more than 25 years. We can also provide service to customers in Clearwater, St Petersburg, Lakeland, and surrounding areas.